The messenger of Greek tragedy is a curious figure. It is a messenger's narrative (angelia) that informs us about the death of Jocasta and the blinding of Oedipus in Sophocles' Oedipus Tyrannus, for example. Such narratives likewise report the madness of Heracles, the slaughter of Aigisthos, the death of Hippolytus, and the dismemberment of Pentheus in the plays of Euripides. Aeschylus's Persians recounts through an angelia the defeat of the Persian fleet at Salamis. Appearing, in fact, in more than three out of four tragedies, the messenger is a familiar inhabitant of one of the most-studied forms of ancient Greek literature. Nonetheless, this conventional figure has received relatively little critical attention. Besides a handful of dissertations, only two monographs devoted to this figure have appeared in more than one hundred years.1 This neglect, I suspect, derives principally from the status of the messenger-speech as a conventional element thought to be rigidly fixed and uninteresting. This study will argue, however, that the convention in question is quite fluid and has much to teach. The pages that follow will make the case that the messenger speaks with a voice that is unique on the tragic stage and that this figure offers important testimony about tragedy's identity as a genre and about fifth-century experimentation with modes of speech. Like most drama, Greek tragedy confronts the spectator directly with a multitude of voices, each with an equal claim, in principle, to truth and authority. The absence of a narrator renders all speech onstage equally authoritative or suspect, equally bound by its status as a rhetorical creation. This particular form of drama, however, augments and complicates this fundamental quality in a variety of ways. As John Herington (1985) has shown, Greek tragedy represents a bold experiment in mixing what were otherwise separate generic forms. Elements of epic, lyric, elegiac, and epinician poetry along with speech clearly marked as belonging to the spheres of oracles, prayer, and lament, for example, all coexist on the same stage. The result, therefore, is not only a multitude of individual voices, but also a plethora of types of speech. Perhaps more than other forms of drama, Greek tragedy exploits such encounters of differing voices as a means of producing opacity and ambiguity in the language of the plays. This multiplicity of generic forms and voices thus conspicuously reproduces what occurs in other avenues of public discourse at Athens, perhaps most of all in the political arena, where debate among "equals" (is 9 goria) was a fundamental premise of democratic systems as they evolved throughout the fifth century b.c.e. At the same time, critics have long treated the messenger-speech as effectively untouched by the rhetorical atmosphere onstage. It makes a modicum of sense that the messenger's narrative should pass as a virtually transparent account unmarked by signs of motivation or partiality: the tragedian needs a reliable vehicle for incorporating offstage events. But the tragic texts themselves display an interest in the functioning of this figure and manipulate our expectations in ways that draw attention to the problematic status of such a figure. Working from these cues, I ask how it is that this figure manages to speak with a voice that, on the whole, has gone unquestioned and unexamined by critics. I argue that typically the tragic texts endow the messenger with a narrative voice that closely resembles that of epic, and that this explains his success on two grounds.2 First, the approximation to Homer in itself carries a powerful authority that resounds uniquely in the Greek literary tradition. The voice of epic narrative transmits that of the Muse, and its adoption by the messenger brings with it something of that divine authority. Second, in appropriating the narrative voice of Homer, the messenger employs a number of narrative strategies that work to claim a privileged status. Most important of these is his tendency within his narrative toward self-effacement that appears as virtual disembodiment. While there is, on the whole, a strong identification of speaker and speech in tragedy, the messenger, in sharp distinction, offers a narrative that in general is conspicuously disassociated from any particular point of view. His narrative, in short, often appears to "tell itself. "3 These practices distinguish the messenger from the others onstage, while freeing his narrative to a considerable degree from the partiality that defines the speech of the other dramatis personae. Regarding these unusual qualities of the messenger as a serious challenge to fundamental premises of the tragic genre, this study takes as its principal subject the epistemic and discursive status claimed by this figure largely through his adoption of epic narrative strategies. The messenger, that is, typically makes (implicit) claims to a secure form of knowledge, while his report presents itself as an unproblematic—and nonrhetorical—account of events offstage. In examining both the practices of tragic messengers and the commentary on these practices in the tragic texts themselves, this study seeks to address the rather far-reaching import of tragedy's use of and interest in this figure. This study also contributes to our knowledge of tragedy's borrowings from earlier generic forms, as it clarifies a confused debate more than a century old about the status of the messenger-speech as an epic element.4 The present study explains the epic affiliation of the messenger-speech on the basis of clues in the plays themselves. Tragedy shows itself to be indebted to epic not only for its characters and plots, but also for its successful functioning as theater. Most important, the rich rhetorical and discursive experimentation of tragedy asks to be viewed against its reliance upon an authoritative "epic" voice and against the genre's own commentary on this reliance. This study, then, combines several critical approaches, offering a synthetic view of the messenger and of the phenomenon he embodies. Drawing on narrative theory, genre study, and rhetorical analysis, I situate the messenger at the intersection of these domains. In doing so, I rely upon an intertextual approach in reading the tragic messenger with and against Homeric texts in particular. As a result, the messenger's generic affiliation proves to be a guide to understanding his narrative practice. These various axes of interpretation together illuminate the epistemic claims implicit in the messenger's account of events offstage. Finally, I show through metatheatrical readings that the tragic texts themselves corroborate my claims in their commentary on the messenger as a theatrical institution. Although this study concentrates on the narratives of tragic messengers, it is not a narratological work in the narrow sense. Indeed, Irene de Jong (1991) has provided us with an admirably systematic account of the messenger in narratological terms. Nonetheless, I consider this study to be largely compatible with and complementary to that of de Jong, even though our interests are quite different. I devote my attention principally to identifying typical practices and examining these for their rhetorical content and for what they have to teach about generic and epistemic issues. Given that the tragic angeliai constitute the genre's most sustained attention to extended narrative, studies of the messenger can not only address the strictly narratological workings of these narratives; they can also ask what use the genre makes of such narratives. This study takes up this latter possibility, inflecting the question in terms of genre and the epistemic status these narratives claim. In short, I draw on narrative theory with my sights set largely elsewhere. My interest in turning the tragic texts' use of the messenger toward epistemic issues derives from two concerns. First, analysis of narrative inevitably hinges on such issues insofar as every narrator claims knowledge of some form. What and how a narrator knows, and consequently how she or he is able to provide the account offered, is therefore central to all narrative. Such a concern is addressed in the opening lines of both the Iliad and the Odyssey, for example, where the narrators in question identify the divine Muse as the source of their stories. Inasmuch as I argue that the tragic messenger forges his own authority along the lines established by the epic narrator, the messenger's epistemic status proves to be central to understanding this conventional figure in a particularly urgent way. Second, this study follows the lead of those who have shown that Athenian tragedy—if not all tragedy (see Reiss 1980)—attends at nearly every turn to questions about language and knowledge: the discursive and epistemic status of the characters onstage—inextricably linked in such a medium—prove to be at issue in perhaps all of our extant plays.5 The messenger, then, qua narrator, invites questions about his epistemic status, but his identity as a familiar figure on the tragic stage renders those questions even more pressing and more potent. For such questions speak not only about the messenger; they speak also about the genre's attention to epistemic issues more broadly. As such, the messenger proves to be a familiar, yet little-understood, figure who promises to illuminate some of the genre's most persistent concerns. Drawing on a variety of critical approaches, then, this study consists largely of close readings of tragic texts. The introduction explains the conundrum represented by the messenger by offering an overview of critical attention to this figure. Chapter 1 takes up our earliest play, Aeschylus's Persians, as a case study that suggests the value of epic narrative as a model for the messenger. Here, generic affiliation and intertextual rewriting combine to produce a nearly paradigmatic messenger-speech. Chapter 2 reviews the literary background of the tragic messenger in epic and lyric poetry. This literary genealogy allows us to make sense of the attention devoted to the messenger in ancient literary criticism, which this chapter then takes up. I argue here that both Aristotle and Philodemus address the question of the messenger as an epic element in tragedy. This section concludes with a survey of tragic texts that demonstrate the messenger's typical strategies. Chapter 3 turns to the metatheater of Euripides' Bacchae and its commentary on the messenger. What Aeschylus's Persians displays at length, Euripides' play scrutinizes as a theatrical institution. Chapter 4 takes up the only fictitious angelia among extant plays, that in Sophocles' Electra. This fictitious messenger-speech constructs an incisive metatheatrical commentary on the tragic messenger in large measure by exploiting the Homeric texts. Both the Iliad and the Odyssey figure prominently in Sophocles' play, culminating in the Paidagogos's false angelia. I argue here that this fictitious messenger-speech reproduces much of the Odyssey's literary sophistication as it offers a provocative commentary on the impact of the angelia in the theater. Chapter 5 then turns to the remarkable messenger-speech of the charioteer in Rhesos. This figure's performance appears to contradict my argument at nearly every moment, as it violates virtually all of the "principles" that enable messengers to succeed elsewhere. I argue that this comic messenger confirms my larger argument in demonstrating precisely what happens when a messenger departs too much from conventional practice. This play also provides a telling commentary on the workings of myth, and it does so largely through the charioteer's unique performance. Finally, chapter 6 takes up the play that perhaps more than any other addresses discursive and epistemic issues, Sophocles' Oedipus Tyrannus. I argue that this play makes telling use of its messengers, enlisting them in the service of its larger, more philosophical interests. In so doing, Sophocles' play affirms the centrality of discursive and epistemic questions in the constitution of the messenger, as it highlights the theatrical conventions that underpin this figure's privilege. In making this argument, I hope to show that the texts of Athenian tragedy offer fertile ground for further study of related issues. The implications of what follows here for the genre more broadly, that is, extend beyond the messenger himself. Given that this form of tragedy borrows from a great variety of generic forms and types of speech, and that the extant texts again and again formulate questions about language and knowledge, the results of this study, I hope, will suggest the value of inquiry along related lines into the epistemic and discursive status of other forms of speech in our texts.6 Similarly, in discussing tragic borrowings from Homer, I hope not only to bring to light some allusive moments, but also to show how tragic texts can use, comment on, and even rewrite familiar Homeric passages. By reading tragedy with and against earlier texts, this study will also demonstrate some ways in which tragic texts can revise and evaluate the tradition of myth itself. This study suggests as well that the role of the messenger bears not only on issues relevant to the history of tragedy. Inasmuch as the messenger plays an important role in tragedy's ongoing investigation into the problems of language and knowledge, he also offers testimony relevant to early philosophical investigations into these matters. Indeed, the experimentation represented by the tragic messenger covers some of the same ground as do a number of these philosophical texts. From Xenophanes to Plato (and beyond), there is continuous engagement with the question of how to construct an authoritative, philosophical voice. Although there are various solutions to this problem, several of these texts incorporate a divine voice.7 Most, however, face the task of speaking "truth" without divine aid. When disavowing such authority, the early Greek philosophers struggle to legitimate their individual voices.8 And this project, I suggest, bears an affinity to tragic experimentation with the messenger. Indeed, a similar problem confronts the historian, perhaps most in evidence in Thucydides.9 These nominally separate traditions prove to be valuable comparanda for one another and thereby demonstrate that tragedy's use of the messenger forms part of a much larger current of intellectual investigation from the archaic period through classical times. In confronting the rather broad territory inhabited by the tragic messenger, I have had to limit my study in a number of ways. I address what I consider the principal and most urgent questions surrounding this figure. I do not, for example, attempt to provide a comprehensive account of the messenger's presence onstage, generally bypassing questions such as those about social positioning (gender, ethnicity, age, etc. ; I do, however, address some of these issues generally in chapter 2). I have little to say about strictly formal issues, one aspect of the messenger that has been particularly well-studied. Similarly, I pay relatively little attention to nonnarrative passages involving or relevant to the messenger.10 I also generally ignore issues of performance in the theater per se: costume, mask, movement, and so on. Instead I focus on what I take to be the most important aspect of the messenger's performance: the narrative itself. Once this form of narrative is better understood as a central participant in tragedy's use of generic forms and in its attention to discursive and epistemic issues, other aspects of the messenger can be more fruitfully addressed. While much work still remains to be done on the messenger—and I expect that all of the areas mentioned above would prove to be productive sites of investigation—it is beyond the scope of any single study to provide a comprehensive treatment of this figure. My hope is that this book will serve as a guide to some of the work that has yet to be carried out. If, then, readers come to feel the need for such further studies, it will be some indication of the present work's success: for in part my aim here is to stimulate critical interest in the messenger and all that the presence of this conventional figure on the tragic stage implies. In transliterating Greek names, I have generally used forms close to the Greek ("Polybos" rather than "Polybus," for example), although I have used the Latinized forms for the more familiar characters such as Achilles, Electra, and Oedipus. This compromise is designed principally with nonspecialists in mind. I hope that purists will be tolerant. When citing from tragic texts, I provide both the Greek and my own translations. Making no claims about the virtues of these renderings into English, I hope that they will be found both helpful and faithful to the originals. I cite from the Oxford Classical Text series: Denys Page for Aeschylus (1972), Hugh Lloyd-Jones and Nigel Wilson for Sophocles (1990), and James Diggle for Euripides (1981-94), unless otherwise noted. 1Di Gregorio 1967 is an evolutionary and formal study; de Jong 1991 is a narratological reference work. 2Among tragic messengers, only the Nurse in Sophocles' Trachiniae and the servant in Euripides' Alcestis are female. As a generally representative form of shorthand, I here speak of the messenger as male. I discuss below in chapter 2 the problem of defining who is and who is not a messenger. 3I borrow this phrase from Benveniste 1971, 208. 4On generic borrowing in tragedy see Herington 1985, Nagy 1990b, 400-403, and Rutherford 1994/95; cf. Ober and Strauss 1990. 5See, for example, Goldhill 1986, chap. 1, and Segal 1986, chap. 3. 6Bushnell (1988) points the way for such a consideration of divine speech in tragedy. 7Most notably, Parmenides and Empedocles. 8An illuminating commentary on this problem appears in Heracleitus fr. 50 D-K.
9On Thucydides see Hartog 1982 and the studies of Crane (1996) and Allison (1997). On Herodotus see Dewald 1987; on both Herodotus and Thucydides, and for a survey of literature on related issues in the historians, see Dewald 1999. 10Messengers always engage in some dialogue before, generally after, and sometimes within the more strictly narrative sections. I will address such nonnarrative passages on occasion, however. Inasmuch as I argue here for the peculiar privilege often attained by messenger-speeches, any account of nonnarrative sections that serves to underscore a messenger's characterization and consequent partiality, for example, would only render his success at claiming impartiality via his narrative more remarkable. Indeed, it is not uncommon for tragic messengers to offer a "coda" that makes clear their feelings about what they have reported, as they summarize their reports. Similarly, the narratives are not uncommonly introduced by expressions of grief, horror, awe, and so on. De Jong 1991 does a good job of showing that even the narratives themselves offer ample evidence of the messengers' sympathies and allegiances that serves to underscore the partiality that inevitably shapes these narratives. Dialogue, then, might well corroborate or extend such characterization of the messengers, but it does little to alter the dynamics at work in the narratives themselves. The messenger who reports important action that has occurred offstage is a familiar inhabitant of Greek tragedy. A messenger informs us about the death of Jocasta and the blinding of Oedipus, the madness of Heracles, the slaughter of Aigisthos, and the death of Hippolytus, among other important events. Despite its prevalence, this conventional figure remains only little understood. 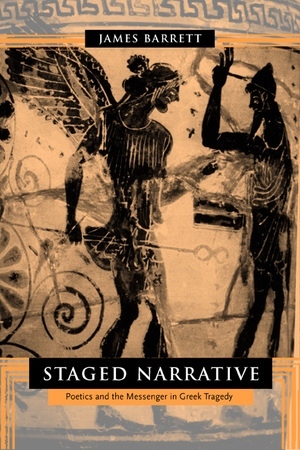 Combining several critical approaches—narrative theory, genre study, and rhetorical analysis—this lucid study develops a synthetic view of the messenger of Greek tragedy, showing how this role illuminates some of the genre's most persistent concerns, especially those relating to language, knowledge, and the workings of tragic theater itself. James Barrett gives close readings of several plays including Aeschylus's Persians, Sophocles' Electra and Oedipus Tyrannus, and Euripides' Bacchae and Rhesos. He traces the literary ancestry of the tragic messenger, showing that the messenger's narrative constitutes an unexplored site of engagement with Homeric epic, and that the role illuminates fifth-century b.c. experimentation with modes of speech. Breaking new ground in the study of Athenian tragedy, Barrett deepens our understanding of many central texts and of a form of theater that highlights the fragility and limits of human knowledge, a theme explored by its use of the messenger. James Barrett is Research Associate and Faculty Fellow in Classics at Colby College.